5 HOW TO MAINTAIN BACK SUPPORT IN AN OFFICE CHAIR? 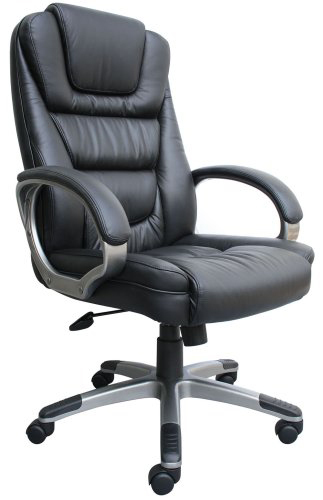 In other posts, we have talked about the office chairs for bad backs, and the most comfortable office chairs available. 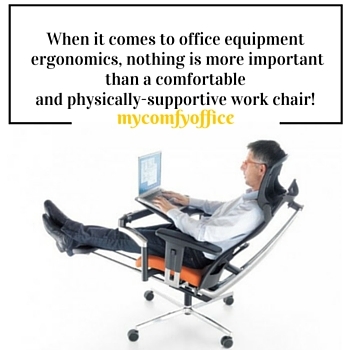 However, it’s important that we provide additions or alternatives to these office chairs and they are in the form of lumbar support products that promote good posture and offer the back support you need while sitting for prolonged periods. 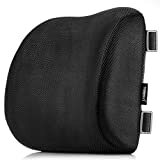 These back support pillows are not just good for office chairs, but they are good for driving, hanging out on the couch, dining chairs etc. Plus, they are portable, so you can take them with you wherever you go. We have taken the best lumbar support for office chairs and reviewed them thoroughly for you, so you’ll have a good idea on what they will and will not do for you. Here we will discuss the pros and cons of these particular products. If you’re feeling the discomfort of sitting for long periods of time; your back is aching and you’re not sure why. 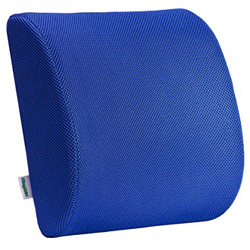 An Elephix Lower Back Support Pillow for office chair might be the answer. It’s not a complete solution, however, by providing some lumbar support where needed can assist in alleviating that nagging strain and relieve some of the pressure of sitting. This particular cushion is designed to be placed behind your back towards the lower portion where your tailbone and spine meet, creating that natural curve. It’s a memory foam insert that fits into a breathable, and machine washable mesh fabric. A lot of cushions slip and get displaced as you move, however, this one stays in place with an adjustable elastic band. It’s also completely portable and comes with a travel case and carry handle for convenience. Use it while driving, working in an office, or watching television. There isn’t negative we can say about this back support pillow for office chair. SimplePosture is another company that makes a back cushion to support the lower back. It’s designed to promote healthy posture by supporting the natural curve and to lessen back pain you’d get from prolonged sitting, or from a condition you’ve already acquired. You can take this compact cushion anywhere which is great if you love to travel, it’s not bulky and is easy to carry. It can be used in a car or in those uncomfortable airline seats. The breathable mesh material keeps your back dry and comfortable, plus it comes with a strap that will keep the cushion in place. In addition, it has just enough firmness to feel good without overdoing it and feeling like a rock instead of a pillow. Another great thing about SimplePosture is if you aren’t completely satisfied with this product, you can return it within 90 days and get a refund. The Love Home lumbar support helps to promote and support good and proper posture while sitting at your desk, driving in a car, or traveling in an airplane. It also alleviates stress and reduces back pain caused from various sources. In addition to supporting your lumbar area, it can also double as a seat height adjustment. Use it to boost your height at your desk, or in a car to increase road visibility. We find that this particular cushion is very versatile. Included with this cushion is the 3D mesh cover with zipper and elasticized belt. 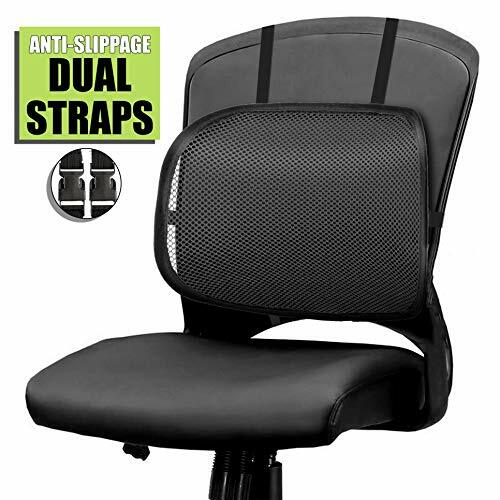 A strap extender is also included which allows you to use the cushion on a wider chair and assists in keeping in place. Its contoured shape fits the natural curve of the spine, providing a complimentary fit. Unfortunately, the Love Home Memory Foam cushion is not machine washable; you must hand wash and hang dry only. However, for the money, it’s a nice selection that should last you a long time. The Easy Posture memory foam cushion is a nice choice if you suffer from sciatica. Also, works well if you just don’t have the time or the money to replace your office chair. It works well with just about any type of chair, even recliners. This lumbar support for office chair by Easy Posture is designed to provide ergonomic support for your lumbar area and lessen the pressure on your back, plus cushions a tired back as well. Other conditions that this cushion can be used for are scoliosis, herniated disks, chronic or acute back pain associated with an injury. Double straps allow you to fit the cushion to any chair and keep it in place so you won’t experience the uncomfortable slipping while moving or changing positions. We also like the fact that this cushion will retain its shape without going flat, plus it’s a reversible design and contains antimicrobial materials to prevent odor. This interesting attachable chair piece is not really a cushion at all, but provides ample support to your back and improves your posture while sitting. 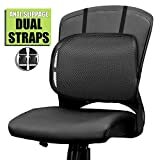 The Easy Posture Back Support Mesh fits nicely on office chairs and provides a very sturdy and convenient lumbar support, plus it’s highly affordable. The mesh material is very breathable and doesn’t create that sticky, sweaty feeling on your clothes from sitting too long. 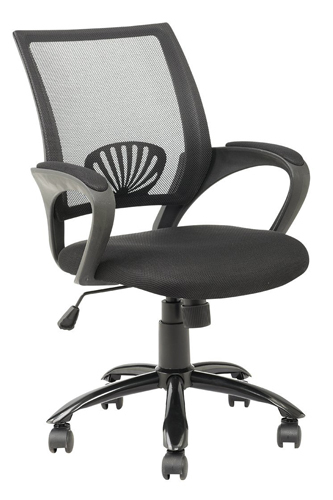 This specific lumbar support product is designed to fit in most office chairs, even those with a high back. It’s also possible to raise and lower the piece for your comfort level. 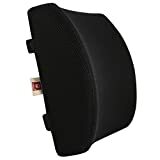 Not only is this Easy Posture Lumbar Back Support great for office chairs, you can also use it for driving, and that includes riding lawn mowers as well. It features straps that you can use to hold the supportive piece in place. Our generation spends half of the life sitting. We have become careless about our posture and completely ignore the effects it can have on our body in the long run. A healthy posture is one where the spine is properly aligned. A posture, which offers optimum comfort, including improved concentration, even through long hours of work. Sitting, they say, is a mechanical interaction between six important body parts: pelvis, vertebrae, muscles, discs between the vertebrae, and the skin. Hence, it becomes all the more important to check and improve our sitting posture. The act of sitting down from a standing position begins with a slightly forward lean of the body (to keep the body balanced) and a subsequent bending of the hips and knees. It is found that About 65% of the total change of angle takes place in the hip joint. If a chair provides you with the appropriate lumbar or pelvic support, there is lesser stress on the lower back muscles. Therefore, it becomes important for us to choose the right chair. A lot of us think that it doesn’t really matter how we sit or where we sit. For some of us, the basic motto in life has changed. Earlier, people only thought how to live a longer life, stay happy, give love and receive love back, but in the present generation, men and women are only concerned about making money and becoming uber successful in life. That is absolutely fine as long as they don’t ignore their health, which unfortunately is not the case. People who work in an office, sitting in an office chair without adequate lumbar support can face a great deal of stress on their lower back. This is because of the seating position, sitting without a lumbar support usually leads to poor posture, which stresses the soft tissues and joints in the spine and leads to terrible aches. HOW TO MAINTAIN BACK SUPPORT IN AN OFFICE CHAIR? 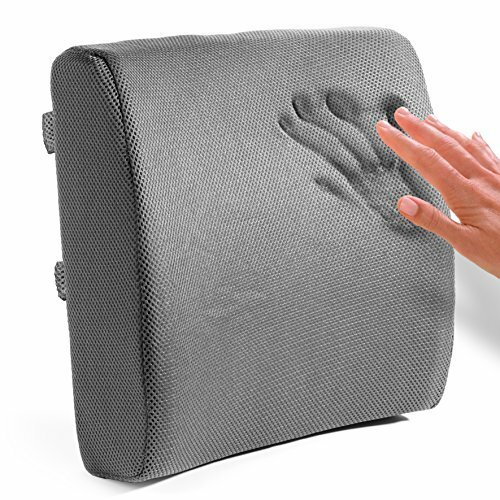 Shape and Size of the Cushion– Shape and size matters for two reasons: – portability and ergonomics. A cushion that is too high for you will make sitting uncomfortable and put pressure on your thighs. One that has too much of a curve in the lower back will make your posture awkward and is just as bad as sitting in a chair with no cushion. Securing the Cushion– If you have a private office then you can use a full chair cushion that is tied to the office chair. However, if you move around a lot or do a lot of traveling, something more portable such as a comfort foam seat cushion could be a better option to consider. The proper back support is just as important as the proper cushion. The best back support for your needs has a positive effect on everything from pressure reduction in the pelvis—meaning reduced risk of pressure ulcers—to better posture that results in healthier shoulders, neck, and improved breathing. The human spine has a specific alignment of natural curves that support the upper body, this alignment is maintained and supported by the trunk muscles and it requires an external support—a supportive backrest—to keep the spine in proper alignment. Slingbacks chairs are not appropriate. A person will experience weakness in the trunk muscles, which in turn causes the pelvis to fall into a posterior-tilted position. This type of seating leads to kyphosis, and problematic curve of the spine–something that should be avoided by switching to the proper supportive backrest. Providing the proper back support combined with the proper cushion addresses the goal of a neutral to slightly forward pelvic tilt – this significantly reduces the amount of pressure on the ischial tuberosities and sacrum. Inappropriate back support is often the cause of skin breakdown in the pelvis area. Lack of proper back support goes beyond skin issues. An unsupported back that causes a pelvis to tilt backward compromises the entire trunk. This puts the shoulder girdle at a biomechanical disadvantage and is the source of many shoulder problems. Proper back support is one of the most valuable components of long-term health for all. If you have a slingback on your chair and you have any back pain or are having any skin breakdown or redness on the pelvis or behind the pelvis, or shoulder or neck pain, then you must consult a doctor. Improper sitting posture or poor office furniture can increase the risk of developing conditions like scoliosis, lumbosacral disk hyperextension, and other lower back issues. Slouching is the one position that puts the most stress on the lower back. Chairs that offer lumbar support have a curve along the lower part of the chair that curves one’s lower back inward towards the belly. This is the most natural and comfortable sitting position for a correctly aligned spine. The muscles that support the spine are also able to relax, as they do not need to keep the spine naturally curved. Correct lumbar support chairs should also include elbow supports to keep the neck at a right angle, keeping neck strain at a minimum. A worker’s feet should be able to comfortably touch the floor, and the eyes should be looking straight ahead at the computer screen or paper when working. While active as a standalone support that can be adjusted in a multitude of ways. While most would be quick to assume that active lumbar support is the way to go, this is not necessarily true. Passive lumbar can achieve the same amount of support as fully active lumbar support. Adjustability is important when talking about lumbar, speaking in terms of an active support. While adjustability up and down is crucial because you can fit it to where your lumbar is, adjust-ability in and out is just as important since it regulates the pressure applied to your lumbar. Adjust-ability in passive lumbar support is rare, as it is built into the frame of a chair, but certain office chairs incorporating passive support also include a seat slider and ratchet back, to allow for adjustability. 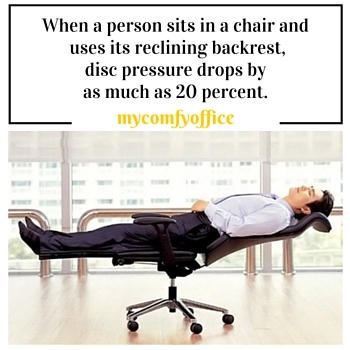 Depending on your back problems, and on the amount of time, you sit in your chair during the day. Most chairs have built-in passive lumbar, but if you feel stress on your back with that format, then try an active support for a while. Finally, it can be said that in today’s world in which work keeps on increasing and a person, mostly stays in the office for a good time of the day, it’s very important that the sitting chair has the proper comfort and support so that future back ailments can be avoided. But having a good seat is not the only factor, having a good healthy lifestyle and regular exercises are equally essential to have a strong and healthy back. It will make sure you are fit and up and running for a very long time. So, how well are you taking care of your back while sitting? 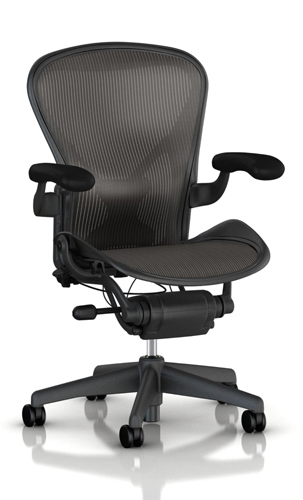 Back supports for office chairs come in the form of cushions, memory foam, and pillows. All designed to support the lumbar portion of the spine. They are constructed to assist in promoting good posture and alleviate pressure off of the spine. We have listed the best lumbar supports for office chairs that you even may use it almost anywhere!